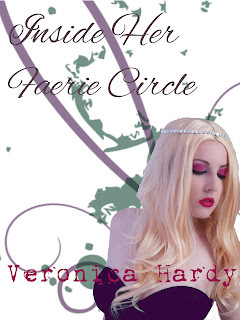 Veronica Hardy Erotica: Inside Her Faerie Circle: 99 Cents! Today through Sunday and a Sneak Peak of the book! Inside Her Faerie Circle: 99 Cents! Today through Sunday and a Sneak Peak of the book! I wanted to let you know that my first release, Inside Her Faerie Circle, is available for purchase at a promotional price of .99 Cents from now until Sunday 4/28! Here is a small excerpt so that you know what you are missing! Lea turned back to continue down the path, her hips swaying in a manner that was intentionally causing Allyson to feel arousal once more. Lea’s body was filled with magic, she was after all a Fae. She wanted Allyson to be turned on, to be confused and most importantly to give into the desires and suggestions that Lea was feeding to her with the use of her magic. The wonders of this place were dreamlike indeed, but the atmosphere certainly felt real. They were close enough to Lea's home now that she could see the details clearly. A beautiful small cottage, this cob home was sculpted with mud and clay and adorned with designs made from that same material. Lea pointed out the sculpture of a rose on the wall next to the door, trunk and branches made of cob, the leaves crafted out of carefully placed stones, intricate windows, small holes between the veins of a leaf on either side of the front of home, a natural sculpture. The home had no lines, its shape rounded and natural. Allyson had never seen such a work, Lea knew, and she hoped that it would have the sought after effect. The porch roof was held up by living trees, supporting the weight of the roof, the floor made of stone, with a path of log slices down the middle to the door. “Not a single piece of nature perished from building this, Allyson. The lives of already given grains and trees were re-purposed into my home with the help of the pixies, twig fairies, nymphs and dryads.” Lea beamed with pride up and the structure that was her abode. “It is wondrous,” Allyson exclaimed, feeling like a child the moment she said it, her face became flush with embarrassment. It was then that Lea knew she had succeeded, motioning for Allyson to enter. She entered the cottage which smelled slightly of patchouli and lavender, a sweet but not overpowering smell and noticed that two cups of liquid were on the wooden table, steam rising from the brim. The floor was stone, the cabinets and furniture natural wood. Lea directed her to sit and took her place across from her, both women sipping their herbal hibiscus tea, the perfect combination of flower, blueberry and herb. “Now that you are mine, love, you will stay as long as you want. I shall introduce you to my friends as well. There are some lovely people here, and they are just as enthusiastic as I am.” Lea grinned smugly. Her prize would be quite the commodity in the land of faerie and she knew it. She could use Allyson to influence people and gain more power in the world, hopefully without making Allyson aware.